I love to travel more often that I actually do. When the opportunity presented itself, we planned a nice trip and it was fun and memorable. Hubby dear is into some serious running this year and one of his goals was to run the 10K in Cauvery Trail Marathon in Srirangapatna. Since the run was scheduled on a Saturday, we decided to leave from Bangalore on a Friday afternoon and return on Sunday - ah, a perfect weekend !! We got a good deal in Ginger Hotels, Mysore through Cleartrip and we grabbed a 2 night stay. Hubby entrusted me to come up with a plan for 2 days in and around Mysore. Trip planning is something I just love to do for hours - browsing through blogs and websites. We started off from our home around 3 PM and hit Mysore road quickly. Stopped for a snack break in Kamat near Channapatna and then continued on our drive. The rains started to lash heavily and it became quite dark. We reached Mysore around 7ish and checked in. Loved our room at Ginger - clean and cozy. The bed was neat and there was a TV too. Having disconnected DTH at home 5 months back, I was so happy to watch an episode of Castle and Big Bang Theory after a long time. The next morning, hubby went for the run while my 3 year old daughter D and I stayed back at our room. The complimentary breakfast was very good and they also offered room service as requested. After hubby returned, we decided to go to the zoo, hoping D would have fun. We took the electric vehicle ride and went around. The weather was good for a while before it became sunny. By the time we left the zoo, we were extremely hungry and had a good lunch at Hotel Sandesh. Though it was expensive, the quality of the food and service were excellent. We then went to Mall of Mysore to while away some time as it was too early to go anywhere else. D was excited to see the small play area where she happily played for an hour. 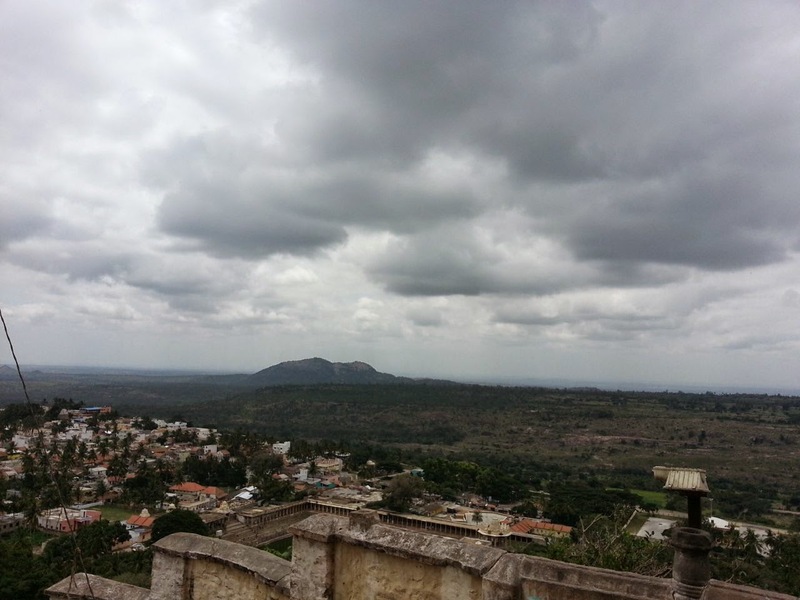 After a quick coffee break, we headed towards Chamundi hills. The view enroute was just awesome and D took a short nap to regain her energy :-) The temple wasn't crowded and we had a good darshan. The next morning, we checked out after breakfast and headed towards Melkote. 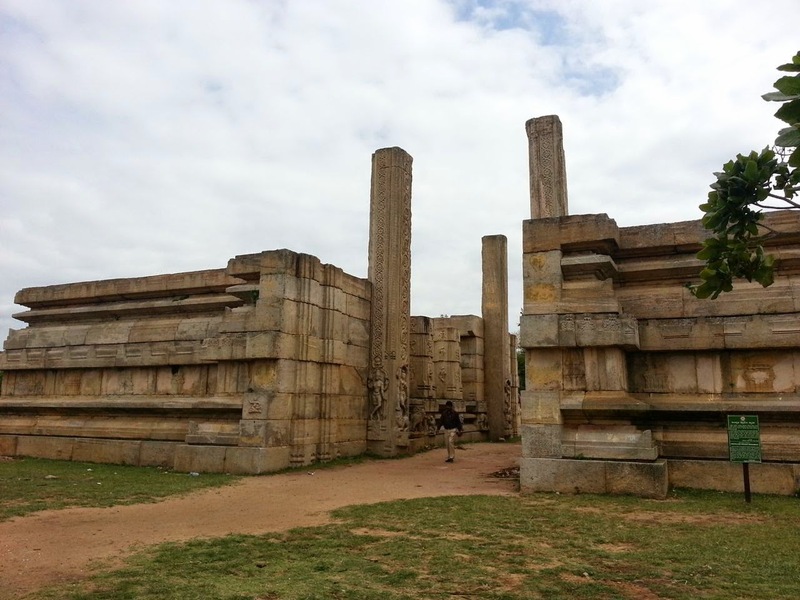 Though we have been to Mysore and Srirangapatna multiple times, we have never visited Melkote before. The route from Srirangapatna to Melkote was scenic, with many villages and sugarcane fields on either side of the road. The drive was so lovely and pleasant. Even if you are not into temples, you should visit this place just for the scenic route. We visited the Cheluva Narayanaswamy temple and Narasimhaswamy temple, which is located on a beautiful hill. The view is just breath-taking and the breeze felt soothing in the afternoon. Thanks to this travelogue, we found Subbanna mess for lunch. The meal on a banana leaf was so sumptuous - puliogare and sweet pongal in particular. They charge a nominal rate of Rs.75. Absolutely worth it! One of my motivations to visit Melkote is to visit the Raya Gopura. Having seen this place in so many thalaivar movies, I know I had to visit it. As I climbed up, I can hear that melancholic background score when Shobana bids adieu to Rajni in Thalapathy. Though the Gopura is marked as a historic monument, it's sad to see plastic and garbage strewn around everywhere. After spending some time walking around, we returned to our car and headed back home. The short day trip to Melkote was really good and I highly recommend you add it to your itinerary, when you visit Mysore next.